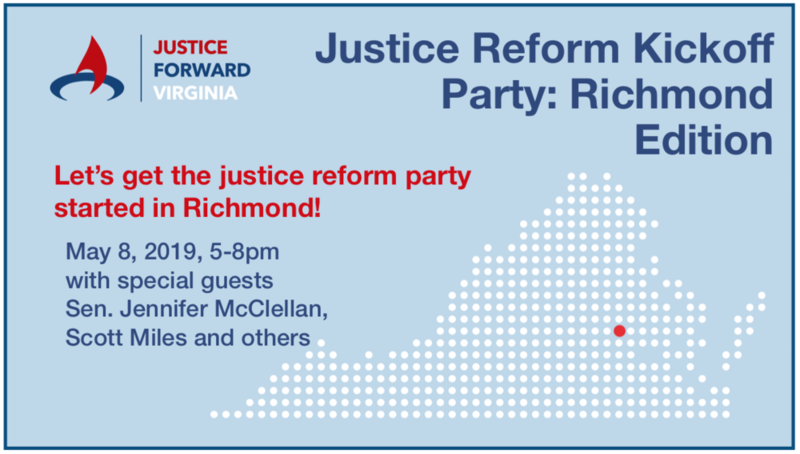 On May 8, 2019, from 5-8pm, JFV will be hosting its Richmond Justice Reform Kickoff Party at Postbellum, 1323 W Main St, Richmond, VA 23220. The Virginia Association of Criminal Defense Lawyers is our co-sponsor. Confirmed special guests include Sen. Jennifer McClellan, Chesterfield Commonwealth’s Attorney Scott Miles and another who we will announce soon. Although JFV has been active throughout Virginia in raising public awareness and with its legislative advocacy, this is our VERY FIRST event outside of Northern Virginia. One of JFV's top priorities for 2019-20 is expanding its geographical reach, starting with the Richmond area. Ashley Shapiro has been named our Director of Central Region Advocacy and will be running point in our efforts to expand, unify and mobilize our community of justice reform advocates, and inspire them to action. That is indeed the purpose of the May 8 Kickoff Party, as well -- to show people who are passionate about justice reform that they aren't alone, to build coalitions with organizations that are allies in our cause, and to open a dialogue with policymakers, as we push for real, meaningful reform to Virginia's broken justice system. Who: Justice Forward Virginia, VACDL and special guests Sen. Jennifer McClellan and Chesterfield CA Scott Miles. Check our blog, Facebook page and Twitter feed in the coming days for more details, including how to RSVP.